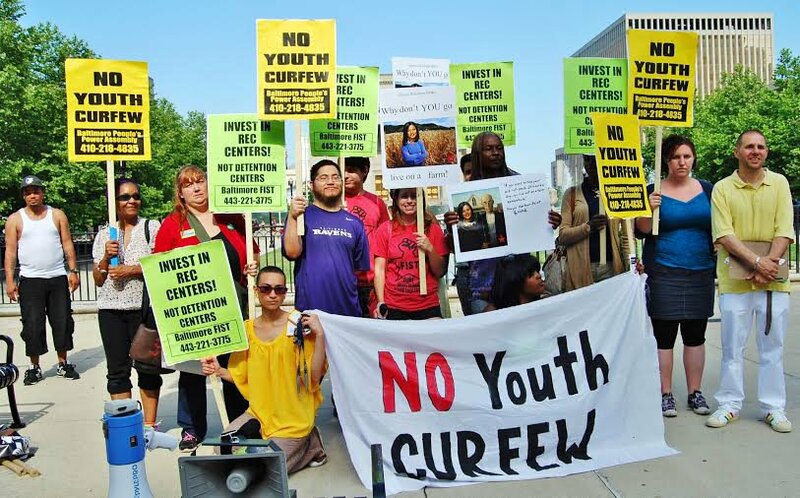 A new curfew law penalizes youth of color. The Baltimore chapter of Fight Imperialism/Stand Together took to the streets outside City Hall on June 2 to protest a repressive youth curfew law being considered by the City Council that evening. Several other progressive Baltimore groups joined the FIST action to oppose the law. During the City Council meeting, protesters draped a banner from the second-floor balcony saying “No youth curfew” and then marched out of the chambers chanting the same slogan. Despite popular protest, the council passed the law by a vote of 13-2. The curfew law, among the strictest in the country, is the latest in a long line of failures of the city government to serve the interests of Baltimore’s youth. Many recreation centers have been closed down over the last several years. Black and Latino/a people in Baltimore, who make up two-thirds of the population, will be the most affected. Currently, people 17 years old or younger are not allowed outside their homes after 11 p.m. The new law will force younger teens to also be inside, as early as 9 p.m., or face harsh penalties. These include being forcefully taken off the streets by police and brought to several youth detention centers that the city government intends to set up. Parents must then come to the centers to pick up their children and pay a fine of up to $500. For a working family barely making ends meet, any fine, and especially $500, is unacceptable and could potentially spell financial ruin for the family. This law will also undoubtedly be selectively enforced against people of color. The Baltimore Police Department has a long history of racist violence. Recently a 19-year-old Black youth, George King, was tasered to death by a police officer at a local hospital. Given this flagrant use of excessive force on a young man, how can anyone expect this expanded curfew law to end in anything but more police violence against youth? At a time when society is failing these poor youth, the city government shows which side it’s on by investing money in detention centers rather than recreation centers and jobs. In order to continue the struggle against the curfew and empower youth to fight back, FIST has set up a “Curfew Hotline” to gather information and document the stories of youth who become victims of this repressive law. These actions mark only the beginning of FIST’s fight!